When my son was young, I used to bake cakes & cookies often, and had been using an oven-toaster-grill (OTG) for many years. When microwave ovens became popular, I changed to convection type microwave oven, which never worked as good as my old OTG as far as baking went. Nonetheless I manage to make some snacks with the microwave oven and this bread basket is one among them. It is appealing to children and with the summer holidays on, this would make a yummy evening snack for your kids! Give it a try! How to make the bread basket: Remove the crust from the bread slices. Ideally, you should cut the slice into a circle to get a round basket. However, I prefer to keep the slice as it is. Smear one side of the slice with butter. Now place the slice in a microwave safe bowl, with the buttered side touching the glass. Cook and serve bowl of 150ml capacity and 3½” in diameter (see Fig.1) would be ideal. 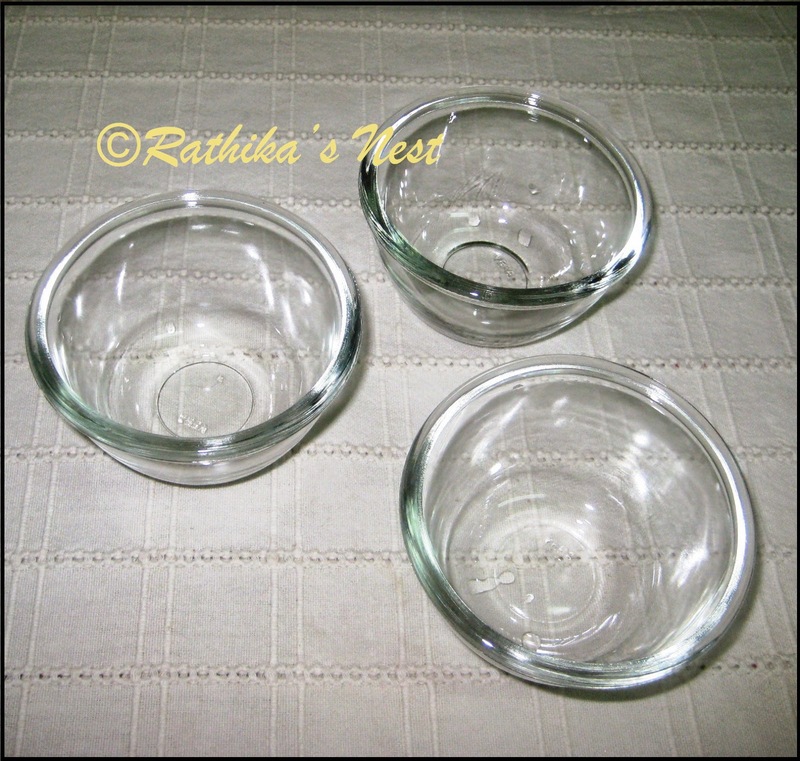 You may be able to use 3-4 bowls at a time depending on the size of the oven you use. Bake the slice in the microwave oven using convection mode at 200o C for 5-8 minutes or till the slice becomes light brown in color. Remove from the oven and allow the slices to cool. The slices take the concave shape of a basket (Fig.2). Leave the bread baskets in their respective bowls. Note: Refer to the instruction manual of your microwave or OTG and adjust the temperature/timing accordingly. How to make the vegetable filling: Cook the potatoes in a pressure cooker for 5 minutes. After the pressure subsides, remove from the cooker. Peel them and cut them into small cubes. Keep aside. Heat olive oil in a wok; add chopped onion and sauté till the pieces are light brown in color. Add chopped tomato. Cover and cook on low flame till oil separates. Add the potato cubes, salt, oregano, dried basil and red chili flakes. Mix well and simmer for 2 minutes. Switch off the stove. Cooking and serving method: Divide the filling into 6 equal portions. Place one portion of the filling in the bread basket placed in the bowl, and top it with ½ tablespoon of grated cheese. Repeat the process with all the slices. Bake the filled bread baskets in the microwave oven using convection mode at 200o C for 2-3 minutes. Remove from the oven and serve hot with tomato ketch up.